those these have time? i mean like would be summoned 30 min and the we have to summon again or is permanent and we decided when we inactive them? Question; You work the drop rate of dna fragments? i have all pets (except Blop) and that journey was the most tedious one i did EVER in this game thanks the horrid drop rate. They are with you until you change maps, log out, or summon a different pet. They don't have a set duration, but if you happen to lose it along your travels just resummon your companion and the pet and buff will reappear! They are permanent until you choose to deactivate them. For normal pets, not yet. 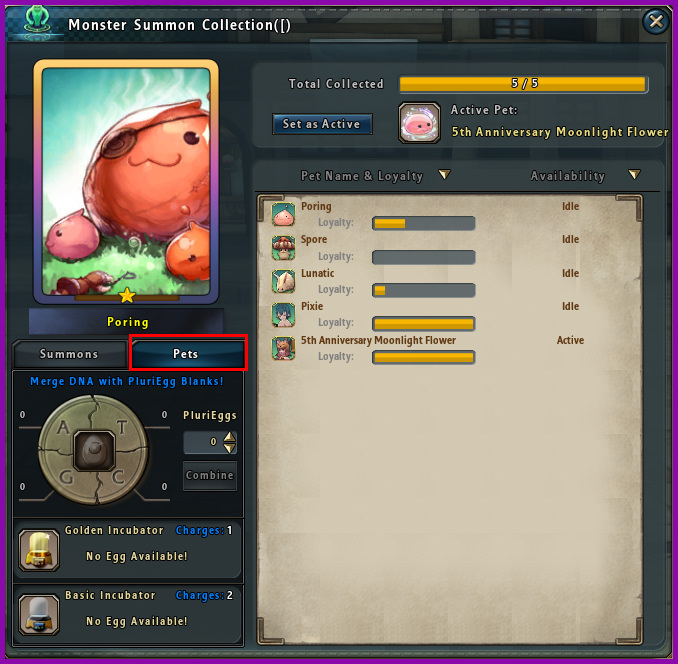 For the Moonlight Flower, there are special high level monsters that you can work together with friends to take down which has a fairly decent drop rate for pet eggs. There will also be other methods of increasing loyalty in future iterations so as long as you activate the event pet by getting 1 egg, you can still upgrade it in the future, as Idun has mentioned in the guide. 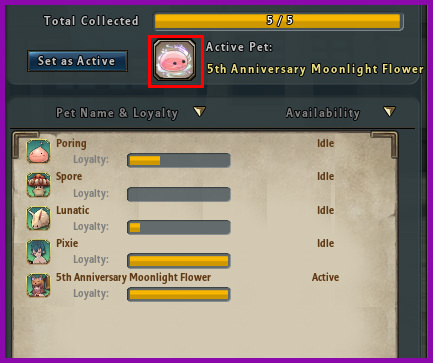 This "5th Anniversary Moonlight Flower" can be purchased with dna from Moonlight Flower? Or is it a different drop from a different monster? What monster is "special high level monsters that you can work together with friends to take down which has a fairly decent drop rate for pet eggs"? Edited by bolagj, 30 April 2018 - 03:31 PM. 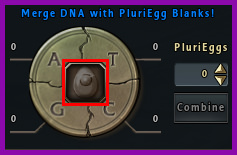 Yes you will use DNA from Moonlight Flower (any of them, the dungeon boss, field boss, Chaos boss, all work drop regular DNA). 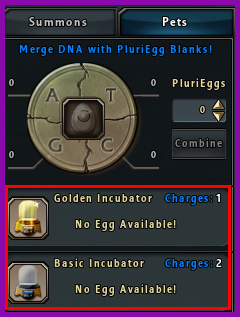 You have to make at least one egg during the event to unlock the pet, as you will no longer be able to make the special Moonlight eggs after the event. You can still level them up after the event though. The special monster is made for the event and you'll know it as soon as you see it. I'm not actually sure what details I can mention, I'll ask Idun. Maybe she'll put it on Patch Notes anyways so I'll check back after maintenance is over. does the buff work in party/raid? Buff is personal, so each person should want their own pet. Buffs are not available in PVP maps though. Edited by Arbalist, 30 April 2018 - 06:38 PM. its pretty impossible to level the moonlight pet to level 1 since you need 40 pcs of hatched egg especially with the bugs that we had yesterday and now no more time to farm them since its just 1 day event. Is there anyway to level the loyalty of moonlight after event is done? besides getting hatched egg? It's not a 1 day event. You have the entire month. As Idun mentioned, in the future there will be other methods to increase the loyalty of a pet, even after the event. You only need to hatch 1 Moonlight egg during the event to unlock her for the future. Same reply as the above, you have a month to get 1 egg. If hunting Enraged is not your comfort zone then you can still farm any of the dungeon Moonlight Flowers. There will be other ways to increase loyalty in the future. I cry because can't play anymore (soon, since EU). Nor can I tease Njoror with pineapple pizza.